With Fall on it’s way here in New England I thought I’d post this favorite scene on one of my favorite local hikes. The water is conveyed through line work. I wasn’t sure about this technique until saw that artist Anders Zorn did water the same way in some of his work. There is something about this scene that fascinates me so I keep redrawing it. This is one of several versions. Maybe it’s the luxuriant foliage in the foreground, echoing the the shape of the mountain beyond. Or the different shades of green on this late May day. This conveys more of a feeling at the time than the reality of the scene. 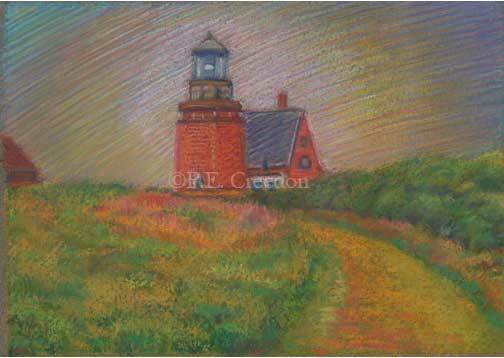 I was not feeling well when we went to see this Light House on Block Island and that comes through in the looming red building against a sky of lurid colors. Really, this week’s blog is more of a horticultural essay than something about art. It’s too bad for you readers, but it does suggest why some subjects are chosen over others for a painting. 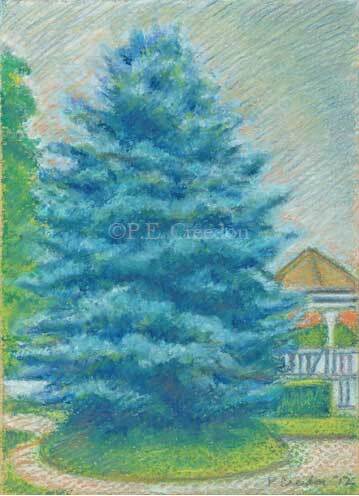 The blue spruce can be found on the Norwalk, CT. Green, which was established some 250 or more years ago, and is the most beautiful section of the city I chose the tree as a subject because my father planted two similar blue spruce trees in front of our house before I was born and they eventually reached a height equivalent to three to four stories high. They caught a spruce blight, which meant my Dad had to spray them early every spring to keep them alive. Unfortunately the stuff turned the trees green, but the new growth came in blue. 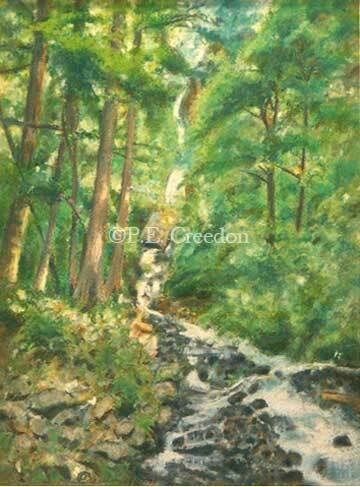 If you look closely at the painting you can see some green behind the outermost blue growth. The tree in Norwalk sparked a memory, and I painted a recollection of my childhood, and a reminder of my late father. So, that’s an example of why some pictures come to be, and others which could turn out as nice or nicer, never see the light of day. Inspired by a Harry and David catalog. They take such gorgeous shots of fruit it made me think about how beautiful a simple piece of fruit can be. 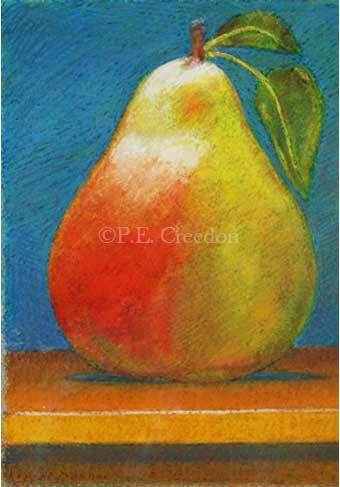 This is my take on a pear. I was left behind in Ct. but I got some nice photos to riff off of when my wife got back so I could imagine myself there. 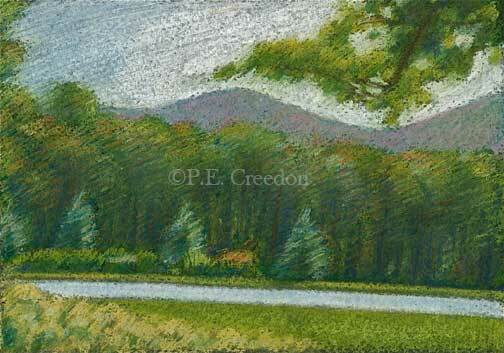 Virtually all my other paintings are done in layers with fixative in between, up to 12 or 15. 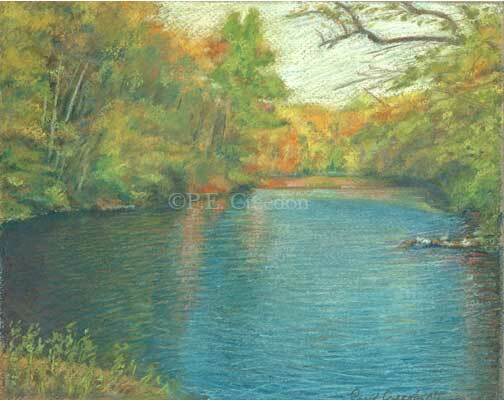 But this one needed no fixative to achieve the effect I wanted. 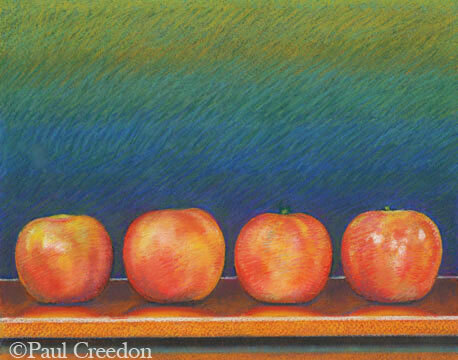 A pastel of four apples in a row. I love the simplicity.